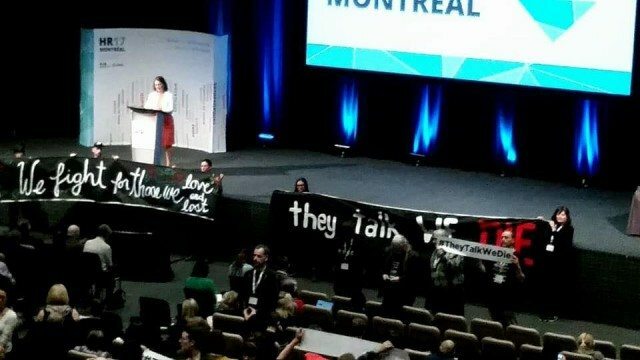 Last weekend, the federal health minister, Jane Philpott, when speaking at the International Harm Reduction Conference 2017 in Montreal, acknowledged that more people have died in the past few years in the opioid epidemic than at the height of the AIDS epidemic in the late 80s and early 90s. This is a sad and shocking fact that activists on the ground have known of a while. Think about that for a minute. The death toll of the opioid epidemic, an epidemic caused by drug prohibition, has surpassed the staggering losses due to AIDS. In 2016, 931 people died in British Columbia due to drug overdose, 343 people died in Alberta from fentanyl overdose, and many others in other provinces and territories died. 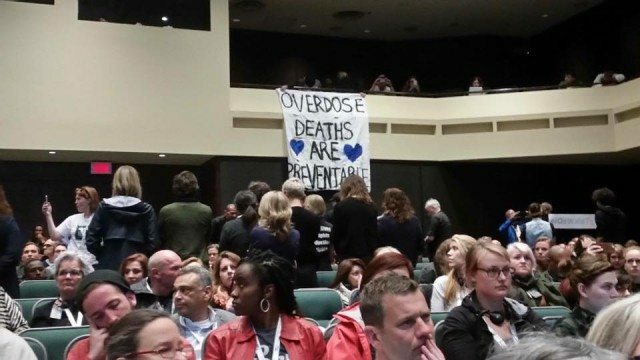 In Ontario, about two people die a day due to opioid overdose. In 2016, it is estimated that 2,300 people died of overdose. These deaths happened under the watch of people who have lived through the AIDS crisis—people like Minster Philpott, who lists working as an HIV doctor as one of the feathers in her street cred cap. If any other group of people were dying at this rate, there would be a national public health emergency declared so that funds could be diverted to support communities and mitigate any more deaths. AIDS was also long-neglected and under-resourced. We think making the connection to the AIDS epidemic is important. People who have been impacted by HIV or who have been taught the history of AIDS activism have an understanding of the massive state silence that necessitated a broad social movement demanding action on AIDS. Making links between the overdose crisis and AIDS can be helpful in calling attention to the severity of what is going on, and can appeal to that sense of injustice that those who witnessed AIDS at it’s height may feel. Making the links may mobilize more people into action. Many of the people now dying of overdose are also people who lived with HIV, but today what is killing people is not the virus, it is poverty, criminalization, and lack of bodily autonomy and security enabled under a context of drug prohibition. So why are there so many overdose deaths? Similar to AIDS, socially marginalized people deemed unworthy of support by the state have faced a deadly health crisis while business as usual went on around them. The lives of people who use drugs are often highly marginalized and are actively criminalized. Prohibition forces drugs deemed illegal to be distributed in unregulated ways that can be unsafe. Drug supplies can be cut with substances such a fentanyl to bypass highly-policed supply chains, and to increase the high and cut costs, especially where production is severely constrained by the impacts of criminal law enforcement. The prohibition of drugs has produced the current overdose epidemic. If people could safely access quality drugs, they would, and this crisis could be averted. Commonly, people understand that harm reduction is about mitigating the health related harms associated with specific drugs. But in the context of prohibition, harm reduction efforts are aimed at mitigating the health related harms associated with prohibition. Harm reduction activists have known this for years: to save lives, put an end to the war on people who use drugs and end criminalization. 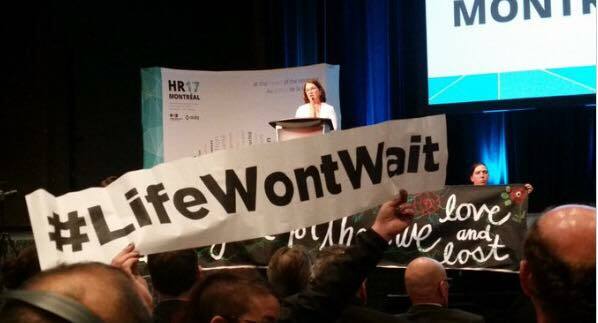 During her speech, Philpott declared she is an “ally” of the harm reduction community, noting that she worked as a primary care HIV doctor and had patients who were drug users. She then outlined that she is pleased to announce that her government will be launching an epidemiological research initiative to document the deaths, because according to her government, we need “more data” on the overdose deaths in order to respond. She did not address ending the war on drugs or on curbing criminal law approaches. The minister’s speech was meet with opposition from conference participants, with a demonstration organized by the Canadian Association of People who Use Drugs (CAPUD), many silently turning their backs on her and holding banners reading #TheyTalkWeDie. 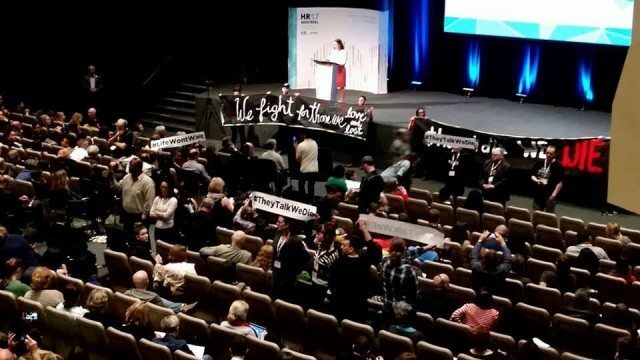 At the end of her speech, protestors chanted, “They talk, we die,” and Zoë shouted, “Thousands are dead, say their names, this in a national emergency,” as the minster walked off the stage with an awkward smile. Zoë continued, “Stop smiling, thousands are dead and you’re smiling… thousands of our friends are dead.” The crowd cheered in support of the protest. Philpott later sat in a closed room with her staff and rescheduled a press conference for later that evening. At the height of the AIDS crisis, activists—including people living with HIV and those who had lost friends and family—fought hard to get the government to listen in a context of institutional silence and inaction. It was only in 1989 that Canadian Prime Minister Brian Mulroney uttered the word “AIDS” for the first time in public. This was seven years after the first death in Canada due to AIDS, and after there had been 820 deaths in total. At the time, activists pushed tirelessly calling for urgent funding for research, funding for support and care organizations, and to expedite the release of new treatments. There were massive protests, solidarity initiatives, vigils, and a wide range of cultural productions addressing the crisis. Along with the broad social movement response, there was the development of an entire NGO sector dedicated to address the epidemic. Philpott announced the numbers of thousands of people who died last year from overdose. During the protest, activists presented clear and proactive solutions that have been widely tried and tested, including the immediate opening of supervised consumption sites, an immediate increase to access to opioid treatments, increased funding to grassroots harm reduction initiatives, prioritized leadership of people who use drugs, increased funding to local groups that build the capacity of people who use drugs, and the immediate decriminalization of the lives of people who use drugs, introducing the legalization and regulation of all drugs. Calling herself an ally to the faces of hundreds of people directly impacted by the thousands of deaths that comprise the overdose crisis, Philpott has the gall to say that she is launching a research project as one of her government’s main responses. The word shame doesn’t even do this situation justice. We were glad to see the minister putting herself in the position to be critiqued publicly at the conference in Montreal, and that she acknowledged the past policy failures of previous governments. But those failures have had the deadly consequences we are seeing today. Philpott’s acknowledgment of those deadly failures is not something to be applauded; if she is the ally she says she is then she must do more. Making links between the AIDS crisis and the overdose epidemic calls attention to what is currently happening to people who use drugs while business as usual goes on around them. People who have lived through the AIDS crisis, who work in HIV organizations, who call themselves allies of the HIV community, who have attended an HIV fundraiser, who have learned about the history of AIDS activism, we make an appeal to you, the time for you to step up and end the massive injustice taking place against people who use drugs is now. We need more resources. We need the government to take our solutions seriously. We need the overdose epidemic to be declared a national emergency. Help us do this. Alexander McClelland is an activist and researcher completing a PhD. at Concordia University and who works on issues related to HIV and criminalization. Zoë Dodd is a front-line harm reduction worker and activist who has been advocating for people living with Hepatitis C and people who use drugs for over a decade. CLARIFICATION: This story has been updated to clarify that Minister Philpott’s participation in a press conference was rescheduled for later that evening. Activists at the conference were not made aware of the change.